GenerationTusk is a group of committed next generation supporters with a real drive to promote conservation across Africa. It is run by a small committee, keen to organise events with the mission of raising vital funds for projects supported by Tusk and determined to spread awareness of the challenges facing Africa’s people, habitat and wildlife today. We aim to create a strong community of next generation conservationists who are committed to raise funds for Tusk’s projects across Africa. To become part of GenerationTusk and be kept up to date with news and events, please follow us on Instagram. For any further information about how you can get involved, please email hannah@tusk.org. We very much look forward to see you at our upcoming events! Harry Skeggs is GenerationTusk’s Affiliated Photographer. Check out his Instagram here. 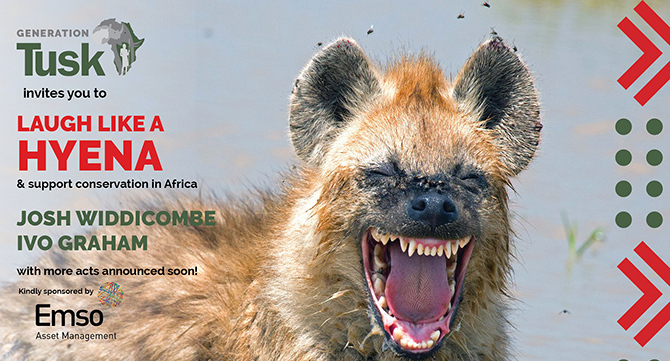 Laugh like a hyena and support conservation across Africa!